Oceanic Art means different things to different people. 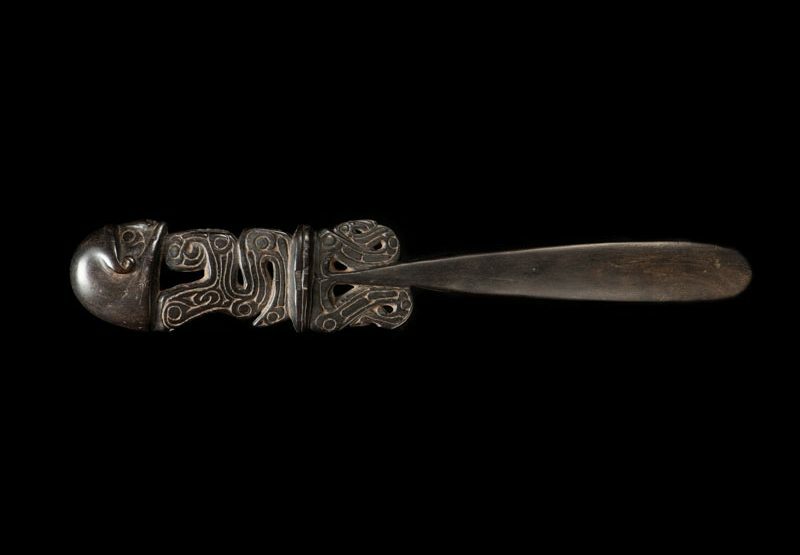 Made by indigenous peoples for traditional cultural and utilitarian practice, artefacts are now prized by many people far removed from their geographical origins. Just why this is so is sometimes hard to fathom. In the last edition of the OAS Journal, and continuing in this edition, Michael Hamson has forensically probed into what it is that gives an artefact its particular appeal and beauty. To analyse what our eyes and senses might instinctively judge, and why, is an intellectually satisfying process. Certainly it was not the intention of the creators of these artworks to appeal to the sensibilities of non-indigenous collectors, but nonetheless they have. Mr Hamson certainly adds to our understanding of this process by looking at specific aspects of individual pieces. A fine Massim lime spatula, ex- Galerie Renaud Vanuxem, Paris, from the Sam and Sharon Singer Collection. See page 10 for more details. San Francisco collectors, Sam and Sharon Singer take this concept one step further by making an element of their wonderful collection the display of groups of similar objects to allow the viewer the opportunity to compare and contrast things of the same ilk. As Mr Singer explains this wunderkammer(cabinet of curiosities) approach yields particular benefits and harks back to the earliest days of ‘curio’ collecting, which was the genesis of today’s museums. This edition also reports on the very successful Tribal Art Fair Sydney, held for the first time at the National Art School in Darlinghurst, Sydney, on 21st of July. This beautiful venue formed a spectacular backdrop to the well attended event with its wide variety of works on offer. Congratulations to Warwick Majcher and the TAFS team and many thanks for all the time and effort. Hopefully the OAS will continue and deepen its engagement with the NAS to promote the understanding, and celebration, of Oceanic art. 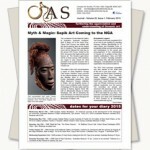 We also present an update on the progress of the OAS Forum 2019, themed Connecting the Old and the New : Aboriginal and Oceanic Art – Collections and Collectors,which will be in Sydney at the beginning of February at the Art Gallery of New South Wales and the Australian Museum. The Forum Sub-Committee, under the direction of Chris Boylan, has been working all year to ensure that this will be an engaging event with an impressive list of speakers. Full details next edition. We would like to thank Betni Kalk for her engrossing presentation at the Australian Museum on July 18 on the Sawiyano people. That talk, and her summary herein, show the efforts that are being made to record the cultural practices of a particular group of people living in remote Papua New Guinea as modern influences and change inevitably seep in. The valuable footage recorded is a new form of ‘artefact’ that no doubt will be highly appreciated in the decades to come. Finally we are pleased to announce the upcoming lecturer by renowned anthropologist, Dr. Barry Craig, whose career in PNG spans well over 50 years. Dr. Craig will recount some of the highlights of his many field trips in the Sepik and elsewhere in a talk entitled (reminiscent of Luigi Maria D’Albertis) New Guinea: What I Did and What I Saw. Certainly anyone who can make this talk will be in for a treat! Wednesday 19 September 2018 – OAS Lecture– Dr Barry Craig on “New Guinea: What I Did and What I Saw”, Australian Museum, 6:30 for 7pm. See details on page 2. Saturday 10 November 2018 – AGM and Lecture– speaker to be advised. ‘Skiffies’ in Mosman , 10am – 12:30pm. Friday 1 February 2019 – OAS Forum– Australian Museum. 2-3 February 2019 – OAS Forum– AGNSW.